Mastercard has unveiled plans to launch artificial intelligence (AI) bots for its merchant and bank partners, allowing consumers to use chat, messaging and natural language interfaces to shop and manage their finances. Mastercard KAI, the payments giant’s bot for banks, will allow consumers to ask the bot questions about their accounts, review purchase history, monitor spending levels and receive contextual offers. Meanwhile, the Mastercard Bot for Merchants will allow consumer to shop and transact on messaging platforms and then check out with the Masterpass global digital payment service. According to research firm Gartner, nearly US$2bn in online sales will be performed exclusively through mobile digital assistants by the end of 2016. Kiki Del Valle, SVP at Mastercard, explained to NFC World the company was aiming to make commerce “more conversational by combining secure digital payments and artificial intelligence technology”. “In doing so, we’re helping to make consumer experience more relevant, personal and helpful. What we’re aiming to do with our bot strategy is trying to think differently and designing products differently and innovating faster than ever before,” she adds. 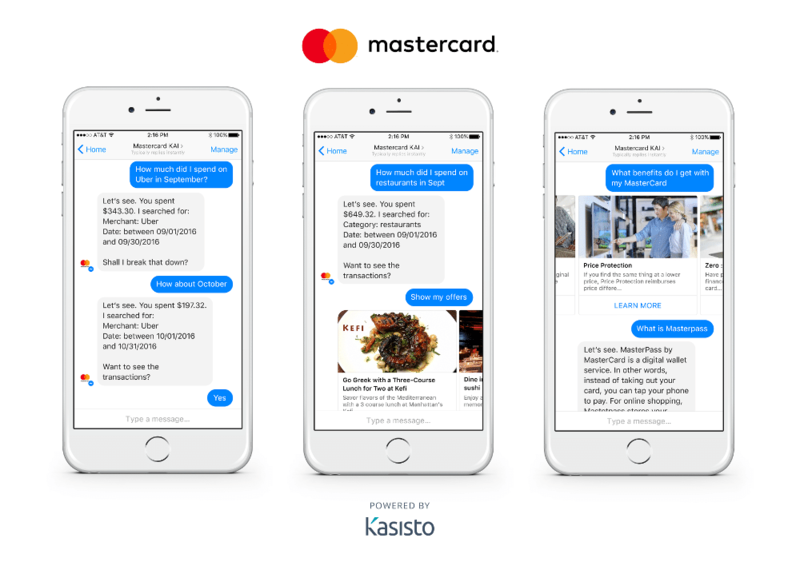 Currently in testing on Messenger, Mastercard is working with Kasisto, the company behind conversational AI platform KAI Banking, to power Mastercard KAI virtual assistants and smart bots for financial services. Starting early next year, US consumers can ask the bot questions about their accounts, review purchase history, monitor spending levels, learn about Mastercard cardholder benefits, receive contextual offers through integration with Mastercard Priceless experiences, and get help with financial literacy. The aim is to roll out the service to the 1bn people who use Messenger every month to “seamlessly extend Mastercard services to customers on messaging platforms and make financial information and decisions part of consumers’ everyday lives”. 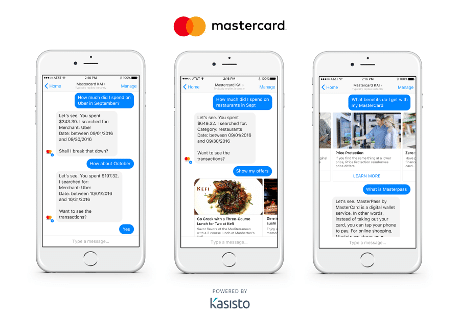 “We’re excited to partner with Mastercard to help drive conversational commerce and engage with consumers where they spend their digital lives – on messaging platforms,” says Zor Gorelov, CEO and co-founder of Kasisto. Developed by Mastercard Labs, the Mastercard Bot for Merchants enables consumers to start a simple conversation with merchants ranging from airlines to retailers, and will run on various messaging platforms. To accelerate development, Mastercard says it will open its experimental Bot Commerce API on the Mastercard Developers platform later this year. Merchants can use this API in a sandbox to begin testing chatbots powered by Masterpass. “Our bot strategy is a simple plug-and-play integration. So, the banks and the merchants can easily integrate the bot into their existing applications to enable engagement with their users on any of these supporting messaging platforms,” Del Valle adds.